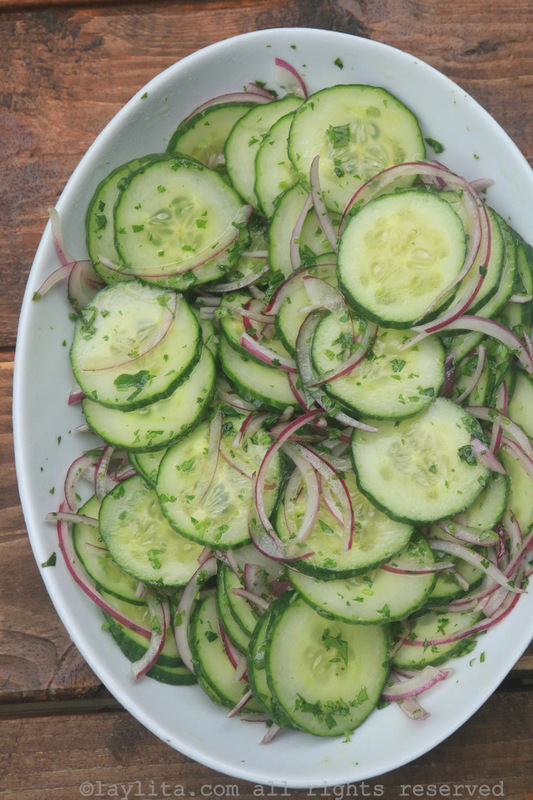 This easy and refreshing cucumber salad recipe is prepared with sliced cucumbers and red onions marinated with a lime cilantro dressing. I don’t post enough salad recipes, especially considering that I make them almost every day. So going forward I’m going to try to post easy salad recipes, even if they’re very simple and basic. 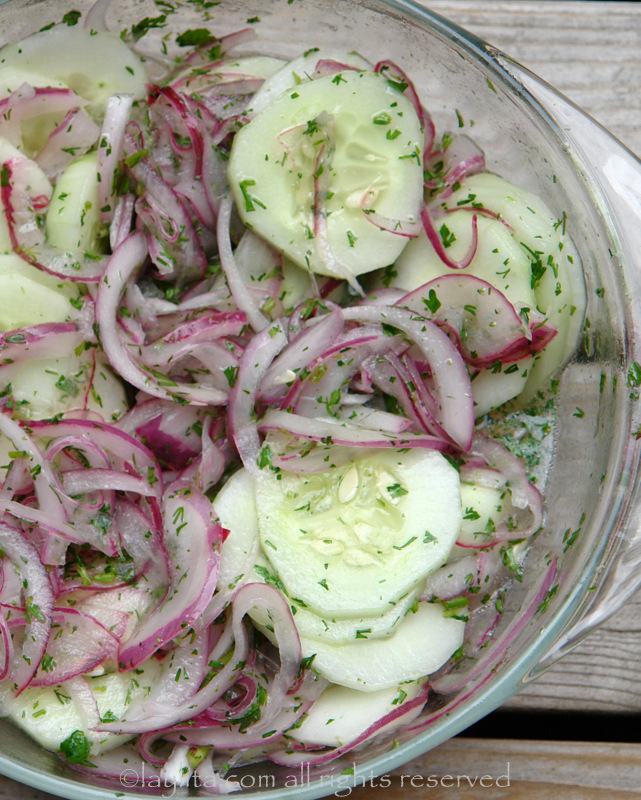 This is one of my favorite ways to eat cucumbers: sliced, mixed with onions and marinated with lime, olive oil and cilantro. 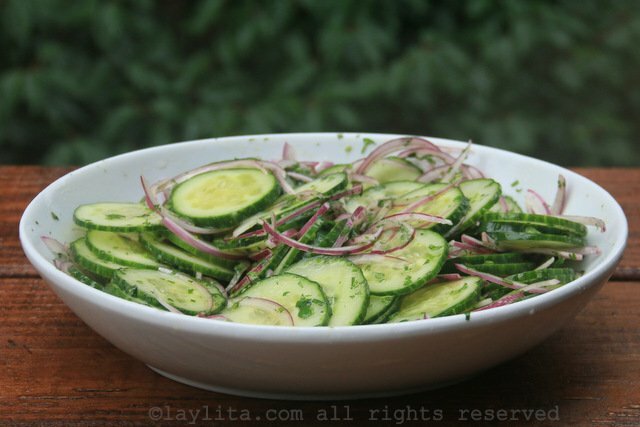 Easy and delicious cucumber salad recipe made with sliced cucumbers and red onions marinated with a lime cilantro dressing. To remove some of the bitterness/spiciness from the onions, place the onion slices in a bowl, sprinkle about ½ tablespoon of salt over the onions. Rub the salt in and then cover with water for a few minutes. Then drain and rinse the onions well. 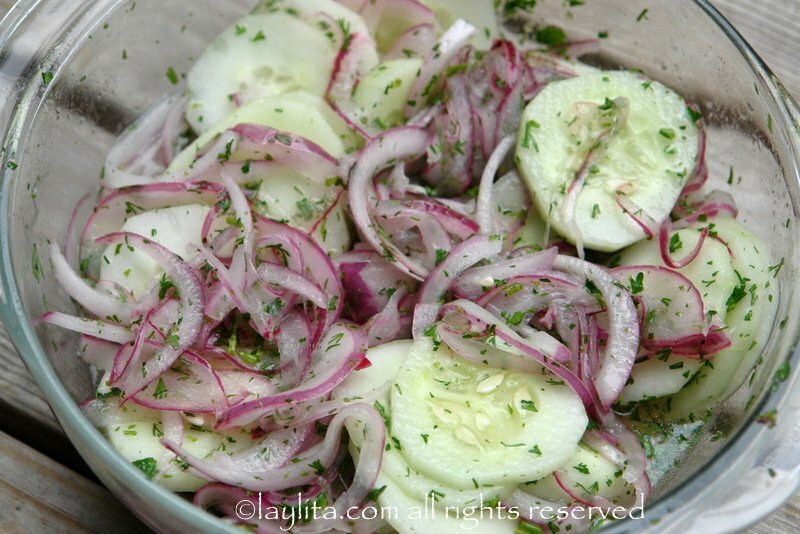 Place the sliced cucumbers, sliced onions, lime juice, chopped cilantro, and olive oil in a bowl. Mix well, taste and add salt as needed. Serve immediately or let rest refrigerated for at least 30 minutes before serving. This super easy cucumber salad can be eaten immediately after you make it, but it gets even better if you let it rest for at least 30 minutes – letting the lime juice start to pickle the cucumbers and onions. 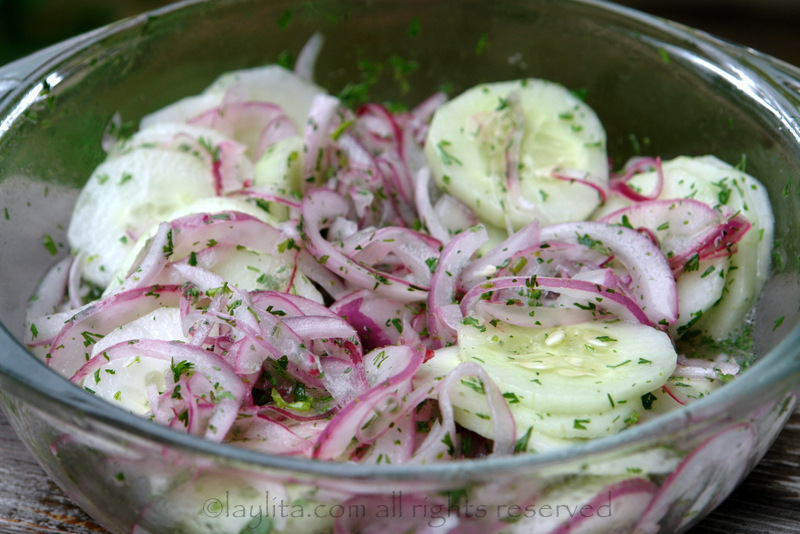 You could also say that this onion and cucumber salad marinated with lime and cilantro is a variation of the classic cebollas encurtidas or lime pickled red onions. This salad makes a great side dish for seafood and chicken dishes. You can also turn it into a full entree salad by serving it over your choice of salad greens, adding some tomatoes/avocados/radishes. If you want you can also add some grilled fish/shrimp/beef or leftover shredded chicken. You can also spice it up by adding some jalapeño slices or diced serranos/habaneros. My new favorite way to eat cucumbers!!! I almost took out the entire bowl last night! Love! Oh my gosh! This recipe sounds delicious. I cannot wait to try it. Probably will add a few cherry tomatoes and tri colored bell peppers. Thanks for the recipe inspiration. I love your site. Every time I come and see what’s new I want to eat plantains and cheese everyday for a week! I’m from Canada and I love food from all around the world. I want to make so many of your recipes they are always delish! I tried all your salmon recipes and LOVED them, especially the pomegranate and orange salsa one. I also tried the soup with plantain dumplings and really enjoyed it. Thanks so much for these wonderful recipes and ideas!